The last post had an article on Vijendra Theertha, the Guru of Sudhindra Theertha and the Paramaguru of Raghavendra Swamiji or Rayaru. What makes Vijendra Theertha important in Madhwa Parampare is that he is perhaps the only saint who saw two of the many avatars of Prahalada- Vyasa Raja and Raghavendra Swamy. He is perhaps the first Madhwa saint or even a person who identified the previous avatars of Raghavendra Swamy and brought it before the world. Thus, the credit for letting the world know about the Shanku Karna, Prahalada, Bahlika Raka, Vyasa Raja and Raghavendra Swamy avatars goes to Vijendra Theertha. Vijendra Theertha was the student or Shishya of Vyasa Raja (1447-1539) and the Parama Guru of Raghavendra Swamy. Vijendra Theertha fist saw Rayaru when he had come to Kumbakonam with his wife Saraswathi. Vijendra Theertha pointed out the young Venkatanatha, who was known thus before being given the name Raghavendra, to Sudhindra Theertha and told him about the many avatars. Vijendra Theertha said Venkatanatha was his guru during his student days and he directed Sudhindra Theertha to hand over the reigns of the matha to Venkatanatha. The first interaction with Venkatanatha triggered so many memories of Vijendra Theertha that he could not contain himself and he waxed eloquent about his student days, his days with Vyasa Theertha and Hampi where he had studied. He realised that Vyasa Raja had taken rebirth to sit on the throne of the Sri Matha and serve humanity for centuries to come. The sight of his venerable Guru as an Grihasta or householder left Vijendra Theertha speechless. He recalled that in his previous avatar of Vyasa Raja, his guru had entered ashrama at a very early age. Vijendra Theertha also remembered that it Vyasa Raja who taught him all the scriptures. He thanked Vyasa Raja for making what he was-a man who had mastered all the 64 arts or Kala as it is called in Sanskrit. Just as Akshobya Theertha had spent years in training Jayatheertha or Teekacharya to become the most renowned scholar of his times, so also Vyasa Raja had devoted time and energy to teach young given Vijendra at Hampi. Vijendra was an apt pupil and soon Vyasa Raja realized that he had with him an extraordinary pupil who would carry forward the Madhwa legacy after him. He unhesitatingly handed over Vijendra Theertha to Sudhindra Theertha of the Sri Matha of Kumbakonam when he came to Hampi. While parting ways with his favourite Shishya, Vyasa Raja had given him his last lesson. It was a lesson that Vijendra would never forget all his life. Strangely, Raghavendra Swamy would give almost the same speech on the day he entered Brindavana. It was this very lesson that came to the mind of Vijendra Theertha when he saw Venkatanatha. Vijendra Theertha also realised around this time that his time was up and he asked Sudhindra Theertha to ascend the peeta of the Sri Matha. Even today, Vijendra Theertha is one of the most popular saints of the Madhwa parampare. He wrote 104 works and they deal with a variety of topics. In all his works, we can glean at one point or other, his respect to Vyasa Raja and his strict adherence to the tenets of Madhwacharya. Though he knew all the 64 arts and he was a master of each one of them, he always remained a humble man. 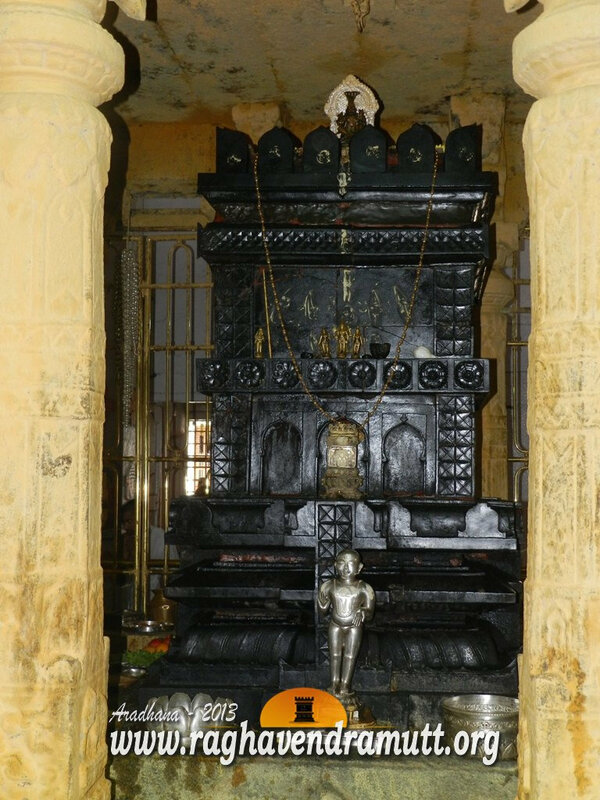 The Vijendra Theertha Matha at Kumbakonam in Solaiaapan Street is where he entered Brindavana. It is also here that Rayaru studied and spent several years. The Kumbakonam Matha, as it is also known, is one of the most important temples for Madhwas. This is the place where the Madhwa trinity of Vijendra Theertha, Sudhindra Theertha and Raghavendra Swamy stayed and preached. It is at this matha that Vijendra Theertha showed his prowess as artiste by sculpting idols of Krishna which he gave away to devotees. He was a voracious reader and a highly articulate person. People feared talking to him as he could easily outsmart them in any topic they chose to converse with him. An expert musician, he was also a brilliant orator, debater, master magician, conversationalist, artiste, illusionist and many more. Till the day he entered Brindavana, Vijendra Theertha never failed to pay his deep respect for his Vidya Guru, Vyasa Raja. He made sure that the avatar of Vyasa Raja would ascend the Madhwa Peetha and spread the essence of Madhwa Siddhantha.